HARARE, Zimbabwe (AP) — Zimbabwe’s former finance minister testified Saturday that armed, masked men in uniform abducted him from his home during the military operation leading to the ouster of longtime leader Robert Mugabe and held him for a week in an unidentified location, fueling debate about the legality of the popular, mostly peaceful takeover by the armed forces. The account by Ignatius Chombo came a day after a High Court judge, a retired general, ruled that the military’s actions last week, which commanders described as a move against “criminals” around Mugabe, were legal. While some critics said it set a dangerous precedent, the decision by Judge George Chiweshe reinforced the military’s assertion that it acted within the law even though it set off events, including impeachment proceedings and street demonstrations against the 93-year-old Mugabe, that ended his 37-year rule. The joyful inauguration on Friday of President Emmerson Mnangagwa, a former top aide to Mugabe, showed that most Zimbabweans are happy to have a new leader who might take steps to revive the shattered economy and grant them more freedoms. Even so, perceptions that the abrupt political transition was constitutionally sound are important to Zimbabwe’s new leadership, which must prepare for 2018 elections and seeks to attract foreign investment. 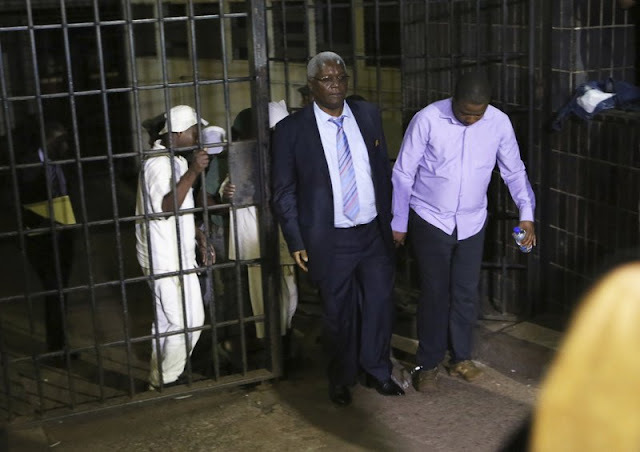 However, Chombo and two leaders of the ruling ZANU-PF party’s youth league who said they were abducted by the military before being handed over days later to the police described experiences reminiscent of human rights violations that were a routine occurrence during Mugabe’s rule. The three men have been linked to a party faction loyal to Mugabe’s wife, Grace, whose presidential ambitions triggered the military intervention. He described in court how the raid in the early morning of Nov. 15 began with two explosions, one of which shook his home. Men entered his bedroom with AK-47 assault rifles pointed at him, his wife and his maid, then handcuffed and hustled him out of the house through a smashed living room window, blindfolding him with his own T-shirt, Chombo said. A one-hour drive to an unidentified location led to days of custody during which interrogators told him that he had performed badly in his role as a government official and ruling party leader, he said. He said he was blindfolded most of the time and never saw his captors’ faces. He was not assaulted and saw a doctor after requesting pills, but suffered lacerations during the forced exit from his home, falling several times while barefoot. Several days ago, his captors told him to pack his things and they drove him home, he said. There, two cars with police were parked. “They said, ‘You are under arrest,’” Chombo said. Defense lawyer Lovemore Madhuku said it was obvious that Chombo was originally taken by state agents, likely the military, and that his constitutional rights had been violated because he was not taken to court within 48 hours of his detention. The police arrest, he said, was designed to provide legal cover for an illegal act. However, state prosecutor Edmore Nyazamba said the police arrest of Chombo was lawful and that there was no evidence the “armed men” who previously held him belonged to the military. The detained youth leaders, Kudzanai Chipanga and Innocent Hamandishe, have been accused of denigrating the military. All three men are now in police custody. 0 Response to "Zimbabwean minister describes raid during military takeover"